Fingerprint sensors. It's one of those things that once you've used it, you can't go back to a device that doesn't have it. But the original ones use a button... I hate buttons. The Samsung 'egg' or the iPhone ... it always 'clicks' when you press it. Samsung went way with the button to have the sensor but put it in an awkward place. Apple has been looking for a way to do away with the button as well, but wants to have it in the front still. But how to get it there and not take up space? Folks for a while have talked about getting the sensor underneath the glass of the display and get it to work. Looks like Vivo will be first to do this. 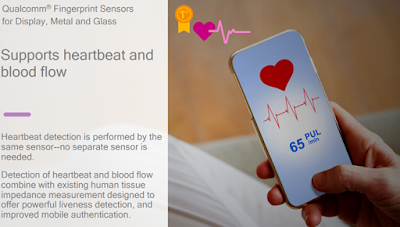 Today, Qualcomm talked about their new sensor that will not only work but will even have the ability to read your heartbeat too! Right now the timetable is looking for wide availability around next summer.